STEVENS Cornish Slate of Pool near Redruth design, develop, manufacture in house and distribute hand made Cornish Slate House signs. Our product offerings also include Tableware, Giftware and Accessories. They are supplied to clients who are looking for innovative ways to enhance their home experience. 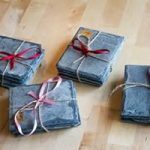 We are committed to making these products with the finest Cornish slate, so customers who are looking for that individually produced item which will be special to them, a valued friend or family member, are sure to find it here. We know that our clients will expect our products to meet their expectations whilst ensuring to the very best of our ability that all deadlines are met. We will continue to develop the range of products we intend to bring to market. Why choose Stevens Cornish Slate? Your Cornish slate products are made right here in Pool, just outside Redruth in West Cornwall. 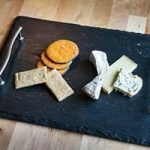 We GUARANTEE your Cornish slate product will be made with slate that Pat has sourced personally from the Delabole quarry. We provide you with artwork for sign orders for you to approve along with clear pricing. You can collect your order from our workshop by arrangement. You can visit our workshop to discuss your requirements. 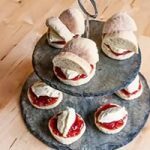 Our work has featured on The Discovery Channel ( How It’s Made ) and we have supplied local developers and national brands such as Davidstow Creamery and we also supply several National Trust outlets. We are very clear that we only use Cornish slate for our work. 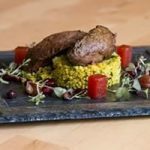 The provenance of our product is vital to you being sure you get what you are paying for. Trust in your supplier is so important. Trust is a very important part of any relationship and particularly so in business. Our slate is not sourced from abroad and just ‘made in Cornwall’. We buy it ourselves at the quarry, transport it back to the workshop and turn it into a product just for you. To ensure you get the sign you want, we follow a simple process. Fill in the sign enquiry form or call us on 07854-953088 to discuss your requirements. We produce artwork to show you what your sign will look like based on the information provided. You can accept the artwork and proceed or suggest amendments and the artwork will be remade for your approval. The sign can be any size or shape. We base the lettering on 2 inch capitals but you can choose larger or smaller lettering size. You can choose from painted or natural finish lettering. You can collect from us or we will courier the sign to you. As soon as you sign off the design, we will make the sign. Please allow 10-14 days. Painting the sign, which is done by hand, takes 4-5 days. We will notify you that the sign is ready for despatch. We love making connections with our customers, so, come and ‘Meet the Maker’. We know from speaking with our customers that completing a ‘generic online sign order’ does not give them the same attachment to their sign as when they can see and touch the product and actually meet with the person who will make their sign for them. Therefore we actively encourage customers if at all possible, to arrange a visit to meet us and discuss the options available to you. Its much better than ordering via an online shop. When you can offer customers the option of actually talking to them, why wouldn’t you? Potential customers find it really useful to get help and assistance in choosing the right product for them. 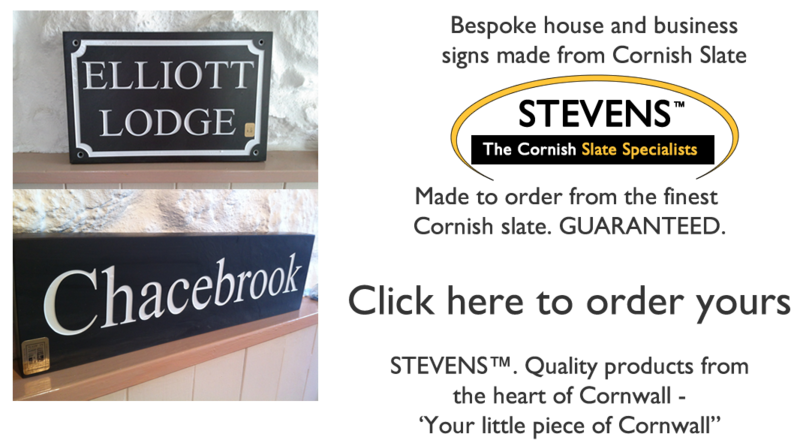 Make that connection with the Piece of Cornwall that will adorn your home and the actual person that will be making your sign. 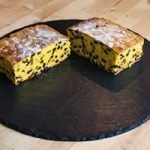 Pat looks forward to speaking with you personally, showing you the slate and discussing how to make that ‘piece of Cornwall’ just for you. Just a few of the many testimonials we get. Good Morning Pat. Thank you I received my sign. It is really nice and your service was excellent. It arrived exactly on time. Thanks again. Hi Pat The sign has arrived safe and sound, and it looks fabulous ☺️ Thank you Rachel . Dear Pat, The sign has arrived safely and looks great. Thank you very much. We would appreciate your advice on the best way of mounting it on the wall. Nick, who recommended you to us, suggested that we would need to mount it on wood before screwing it to our wall. However, now that we have seen what a thick and solid looking piece of slate it is, we wonder if that is actually necessary. The wall on which it is to be mounted is a brick wall but old and slightly uneven. Your recommendation would be much appreciated. Our sign has arrived. Can we have some advice? Hi Pat Package finally arrived just before 4pm.The signs were well packaged and look really good. I will send photos when we get them up – the 23 is for my son as he has just moved into his first house! Thanks for all your help. Hi Pat Sign arrived It looks great. The recipients are over the moon. Hi Pat, Just to let you know that the plaque has arrived safely and we are delighted with it. I will send photos when it has been put up. Hi, The sign arrived yesterday very pleased with it, there is one problem I thought I ordered a fixing kit but obviously not. Could I therefore order one now. Thank you. Sorry its taken so long to get these photos to you. We are really pleased with the sign and hope rouse you again for a memorial stone. Your questions answered. Click a heading to open questions in that section and the ‘+’ or ‘-‘ open and close that question. MAIL US if you have any other questions. We respond to all enquiries promptly but we are human and occasionally something gets missed. Emails also vanish without trace. If you send in an enquiry and have not had a response in 24 hours, the most likely scenario is there is a glitch in the email system and we have not seen it or you have not received a quote we have sent out. Do please contact us by phone on 07854-953088 if you have not had a reply in 24 hours. Anything from a small heart to a fire hearth. Hearts, Coasters, Picture frames, Hearts in frames, Cards, Table mats, Chess boards, Oxo games, 1/2/3 tier cake stands, Cheeseboards, Memorials, Speciality pieces, Wedding and event pieces, Fully personalised items for presents and gifts, Clocks, Mirrors. House signs, form a single number up to signs 1000 x 800mm in size. 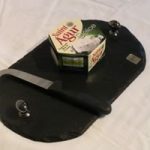 We supply to the National Trust, business and the public. If we have not listed something you want, then please ask. We are here to try and create something unique to you. We do not have a retail shop but we do have a workshop where you can visit us and talk about your Cornish slate product requirements. It would be best if you made an appointment to do this as we deliver to various clients and visit the quarry too for supplies. Please call 07854-953088 to speak with Pat and make an appointment and you can ‘Meet the Maker’. Stevens Cornish Slate was opened in 2013. Our workshop opened in 2014. We started work in a garden shed but quickly outgrew it. At Stevens, we have worked hard to build up a name within the sign making business for our service and workmanship and we are active on all social media platforms where you can see examples of our work. ‘Stevens’ is a St Ives name where Anne’s family is from. Her father, grandfather and great grandfather were fishermen and lifeboatmen. You can call Pat on 07854-953088 if you want to discuss any sign options. 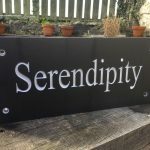 We are more than happy for you to collect your sign from our workshop in Pool, between Camborne and Redruth, when it is ready. This will be done by arrangement. You can pay on collection or beforehand by bank transfer if you wish. How do you price a sign? A number of things are considered when pricing up a sign. As we do so many variations for customers, the only standard prices are house numbers and these are £25 or £35 (for one/two numbers), depending on the slate used. The number of and size of characters. Are you adding a design? Can I mix fonts on the same sign? You can have multiple fonts on the same sign. We can also make letters and numbers different sizes on the same sign to make them unique to you. If you have any special requirements, please ask. We are happy to help. Can I add a design to my sign? You can add designs to your sign but we can only work in two dimensions. We have added trees, dogs, birds, castles, tin mines and other designs. If you have something in mind that will make your sign unique, please ask us. We aim to produce what you want and will do whatever we can to accommodate. The artwork we provide will show how your sign will look. What font styles can I have? Our three most popular font styles are Times, Artifiker and Gill sans. We have many more. If you have a personal favourite, please ask. If we have it or can get it then we will be happy to make you sign in that font. Artifiker – a blocky font that sits part way between Times and Gill Sans. We base the fonts on 2 inch capitals but will make the lettering any size you wish. For a more ‘rustic’ look, you may want to consider riven slate as an option. It is about 6mm thick and may be slightly uneven. Riven slate can have a hand cut or sawn edge. Please specify when ordering. Riven slate can only be fixed using screws. When mounting a riven slate sign, great care must be taken not to over tighten screws. Screws should be ‘pinch tight’ only. Slate is a layered rock product and whilst we take every precaution when cutting the sign, hidden fracture lines may not be apparent at that time. We have not had a single occurrence of a sign breaking at the screw hole when instructions have been followed. We are sorry but we cannot be responsible for breakage if the sign breaks during fixing. ‘Block’ slate is between 22 and 30mm thick but more usually around 25mm thick and is the traditional product for house signs. The face of the sign comes lightly polished (egg shell) and the edges may contain saw marks. Lettering is engraved into the slate and then painted in using a top quality professional sign paint. The slate is treated to help prevent against the effects of weather. To maintain the finish, wash with soapy water. If you apply any further stain protection, keep it away from the letters as this will stain the paint. Delivery will be by courier. We currently use UK Mail and delivery will usually be ‘next day’ although we cannot guarantee this. Weekends not included. If you have any special instructions for delivery, please tell us. We will only ‘leave on doorstep’ if you specifically request it but we will not be responsible for and will not replace any item ‘not delivered’. Overseas clients MUST contact us before ordering as delivery is priced per job based on weight and size of package. Payment for the goods will be required in full with the order with postage payable when the order is ready for despatch and we can get an accurate price. We will not start work on any order until payment has been made unless it is agreed that you will pay on collection. Blind fix means there are no visible screw holes. We supply steel pins and holes that are drilled approximately 12mm into the reverse of your sign. The pins should be set in place using a strong 2 pack resin suitable for the surface you are mounting to. Make sure they are set straight. (Please note we do not supply resin). To ensure that the holes for fixing the sign to the wall are in the right place, make a template of the reverse of the sign using ‘greaseproof paper’ and then mark the holes on the wall using the template. Before applying resin to the holes, make sure they are dry and dust free. When you have applied resin to the fixing holes, push the sign onto the wall and hold for 3-4 minutes while the resin sets. If you intend removing the sign in the future, you should have screw fixings. Blind fix is an optional extra at £10 and is NOT available on riven slate signs. Slate look really nice with a brass screw and we suggest 3 inch brass screws to fix your sign to the wall. Steel screws will rust and after a period of time may leech rust onto the front of the sign. DO NOT OVERTIGHTEN screws. Pinch tight will hold your sign to the wall. We send out the artwork as a PDF attached to your email. If you have a ‘hotmail’ account, these emails can frequently be found in the junk box. Sometimes they may not arrive at all and you should get back in touch with us if you do receive the email. Click on the PDF to open and view it. We produce a likeness of your sign and send to to you in PDF form. It’s WYSIWYG (What You See Is What You Get) so you know just what your sign will look like.